The Cuisinart 6425-30D everyday pan features durable hard anodized aluminum core construction for fast and even heating eliminating hot spots. 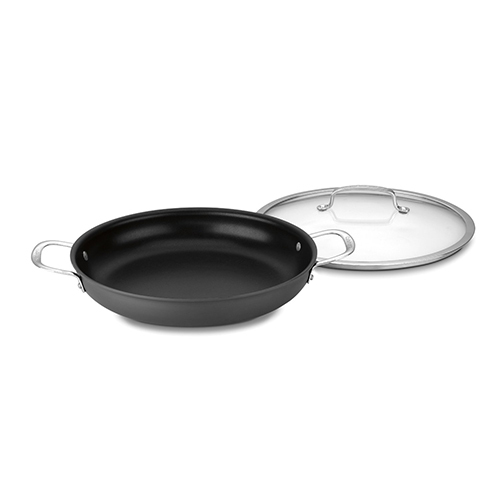 The pan has reinforced nonstick cooking surface for lasting food release, healthy cooking and easy cleanup. It is oven safe up to 500°F and freezer safe for easy food storage. The pan has solid stainless steel riveted handle which offers perfect balance to provide exceptional control when gently tossing food and stays cool on the stovetop. The tempered glass lid seals in moisture and nutrients for healthier, more flavorful results. It can be used on the stovetop, in the oven, or under the broiler. The 12 Everyday Pan W/Cover Contour Hard Anodized has many exciting features for users of all types. The 12 Everyday Pan W/Cover Contour Hard Anodized is sold as a Brand New Unopened Item.